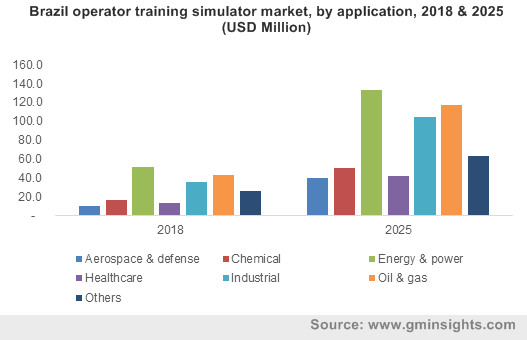 Operator Training Simulator Market size valued at USD 8.5 billion in 2018 and will grow at a CAGR of 13% from 2019 to 2025. 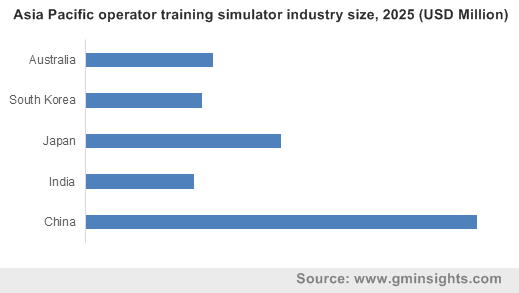 Growing demand for skilled workforce in businesses will drive the demand for operator training simulator market over the forecast timespan. Several businesses are actively training their employees to reduce industrial accidents and improve the safety of workers. Employees are trained about the industrial equipment and processes by examining all the safety features to ensure the minimization of errors. With the rise in costs of hiring a skilled workforce, the businesses are now shifting toward training their existing employees on new job roles. Moreover, simulation-based training is being incorporated by businesses to provide information about a new job role with the detailed analytical view of the component, parts or processes. It offers several other advantages to the business such as customized learning path, risk-free environment, fun & interactive training experience, and enhanced knowledge retention. Such factors are providing an impetus to market growth. With the increasing demand for an effective & reliable employee learning platform in businesses, manufacturers are continuously engaged in developing modern solutions to help companies in providing enhanced knowledge about industrial tasks. Growing demand for advanced solutions, such as Head Mounted Displays (HMDs) and interaction devices, will drive the operator training simulator market over the coming years. In February 2018, Honeywell International, Inc. announced the launch of a cloud-based simulation software that utilizes the combination of AR and VR technology to train employees on critical industrial operations. The software provides 3D visualization of the industrial environment and allows employees to walk through a realistic 3D model of the facility for better understanding of machines and parts. Moreover, in May 2016, L&T Service Center in India adopted this innovative solution offered by Scania Commercial Vehicles, to provide operators a realistic feel in different mining situations with detailed instruments, dashboard, and exceptional features. In 2018, the software segment accounted for over 50% of the market share and is anticipated to grow at a steady pace over the forecast timeline. Immersive simulation software will witness high growth owing to benefits such as increased efficiency, decreased errors, and reduction in cost maintenance of the systems. The software connects all operators and plant personnel in a 3D realistic virtual learning environment, enhancing the interactivity with various machines, parts, and processes. Over the coming years, the market will witness an increasing adoption of immersive simulation technology for procedural training, safety scenario practice, operator familiarization, maintenance planning, knowledge capture, and team training. The implementation of the technology aids in reducing the costs and time-to-value on the job training, by around 30-40 percent, contributing to the maintenance budget savings. In 2018, console training simulators accounted for a major part of the operator training simulator market share. These simulators replicate the control room and Distributed Control Systems (DCS) and help the staff to have in-depth knowledge about the process and automation control. The solutions provide safe & efficient operations, minimizing risks and increasing production performance. Moreover, they help operators to make effective decisions in emergency scenarios, ensuring more stability and lowering the risks of accidents. The rise in industrial automation and process control requires operators to have appropriate knowledge of operating a plant safely and proficiently. The oil & gas industry is equipped with different machinery working on various platforms, making it difficult for new staff to operate these heavy machines, forcing plant owners to provide console operator training to users to interact with machinery in the field. These factors are will drive the market over the coming years. Increasing demand for effective training modules in the aerospace & defense sector to reduce the number of accidents occurring due to operators’ fault will drive market growth. The sector is anticipated to witness a growth of around 20% from 2018 to 2025. The sector is incorporating the technology to provide flight training to pilots. Full Flight Simulators (FFS) are being used for this purpose, providing motion & visual capabilities to train professional pilots regarding the flight controls characteristics, aerodynamics, and ground handling controls of the aircraft. The pilots are required to clear simulation tests to fly the actual airplanes. Applications of simulator tools in the defense sector will allow the military personnel to be trained on war and combat situations by learning different defense tactics. Meggitt Training Systems developed FATS 100MIL simulator model, a small arms trainer that is ideal for transportation between remote locations. The Asia Pacific operator training simulator market will grow at a CAGR of over 16% during the forecast timeframe. The region is witnessing an increased focus toward the development of a highly skilled workforce. Businesses are engaged in improving their production capabilities and efficiency, encouraging them to implement effective training programs. Increased complexities in manufacturing processes, system design, and equipment handling are driving the demand for training simulators. Moreover, global companies are outsourcing their manufacturing or production processes to the region due to the high availability of skilled and cheap labor. China and India are the major markets that are offering outsourcing services to other markets. The countries are the major producers of skilled workforce owing to the increased importance and awareness toward education or training programs. It forces industries to implement cost-effective and efficient learning modules to improve business productivity, propelling the market growth. 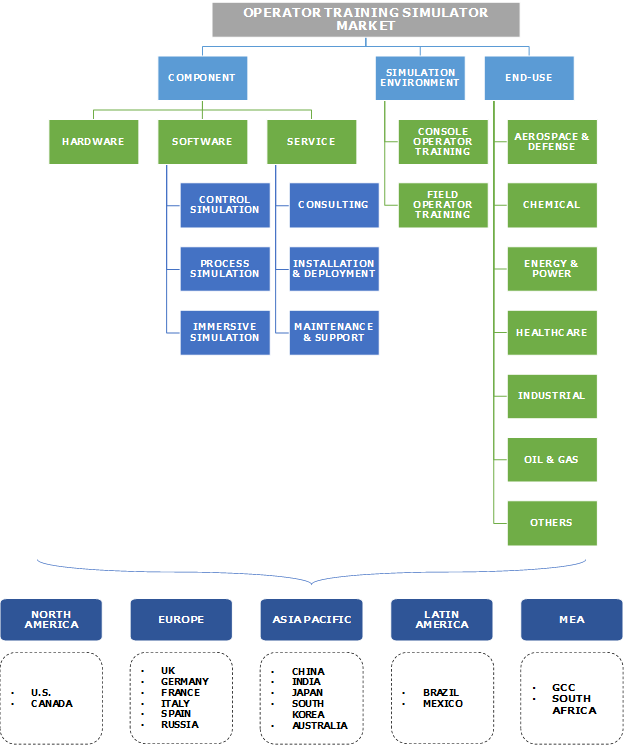 Key players operating in the market are ABB Group, Applied Research Associate, Inc., Aveva Group PLC, EON Reality, Inc., Honeywell International, Inc, Immerse Learning, HyperionRSI Simulation, Schneider Electric SE, Siemens AG, FLSmidth & Co. A/S, ESI Group, DuPont, Inc., AspenTech, Yokogawa Electric Corporation, and Andritz Group, among others. The players partnering with other companies to expand their business presence and product offerings. For instance, in January 2015, Hyperion Systems Engineering and CORYS announced the establishment of new company, HyperionRSI Simulation that will deliver training simulator and dynamic simulations solutions in the market. Similarly, in July 2016, Honeywell International, Inc. and SNC-Lavalin GTS announced a strategic partnership to optimize their offerings of simulators. In the operator training simulator market, several players are engaged in offering innovative solutions to customers for improving their training modules. Growing demand for simulation-based modules in different application segments, such as oil & gas, energy & power, chemical, and aerospace & defense, for providing a detailed view about the complex processes and conditions, is providing several growth opportunities to the market. The players are introducing innovative solutions, allowing employees to be trained in the areas that can be handled only by experts. For instance, in February 2019, Sandvik AB announced the launch of a simulator that provides a flexible & compact solution to train the operators and maintenance personnel on DD422iE, DD422i, and DT922i mining drill rigs. The solution is specifically developed to improve operator performance while using the drill rigs in underground drilling applications.